Looking for a an item for conference or event attendees? This attractive and stylish wire bound journal with white 15 pt. coated cover custom printed in full color. Inside, 50 page, white 20 lb. bond with light gray rules printed on one side. Each comes with black heavyweight back, elastic pen loop and a free mini dynamic opaque black pen. 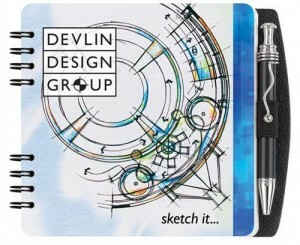 Great for event attendees, students, teachers, artists, employees, busy executives. 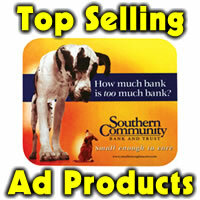 A bold and useful promotional product that will be used again and again. Binding can be at the left side or the top and binder choices: Black, pewter or white. 250 min at 3.96 ea, 500 at 2.89 ea and 1000 at 2.36 ea. No set up for this full color imprint. Item S2R4-PS. Made in USA.